Description: The Guitar Bar is a very unique way to use Half Hitches. They are arranged in horizontal rows, and are attached to vertical holding cords. You turn over the sennit every other row, which alters the appearance of the knots. The design will resemble the frets of a guitar. 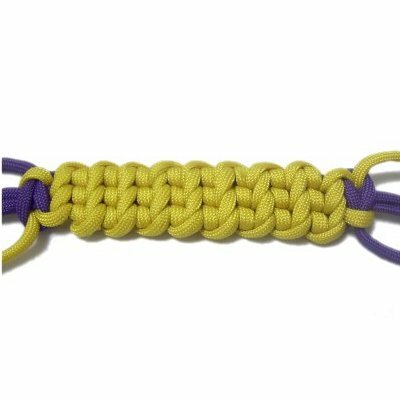 This interesting Macrame design can be used for bracelets, belts, key chains, and other similar projects where you need a thick sturdy band. Important: When using materials less than 4mm wide, the band will have a tendency to twist as you make it. Bend and flex the bar to eliminate the twisting if you can. 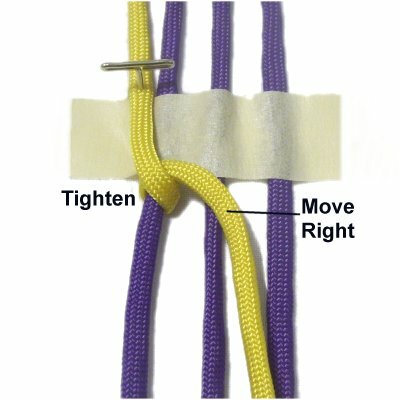 Try to tighten all the knots the same amount, and keep the holding cords taut. I found the Guitar Bar on the Fusion Knots website. Click on the link or image to visit. 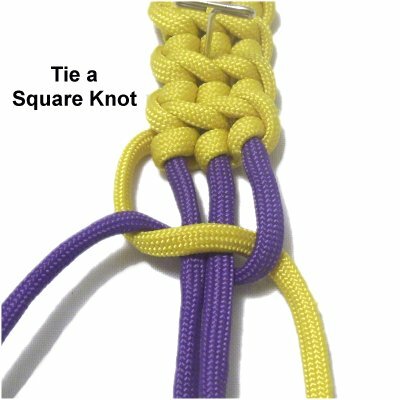 The video gallery contains tutorials for a large variety of interesting combination knots. I highly recommend the books! To practice, you need at least three 20-inch holding cords, and one 72-inch working cord. Two colors were used for instruction only. It's better to use only one color for this design. 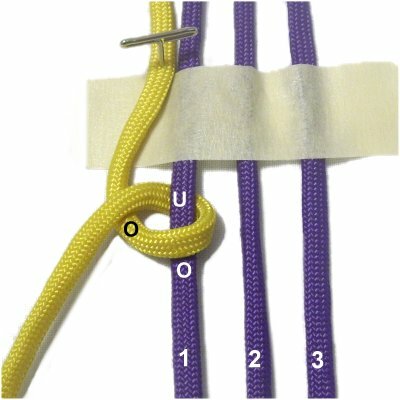 Important: These instructions show you how to start the design is the center, since that's usually the best option for projects like Paracord bracelets. 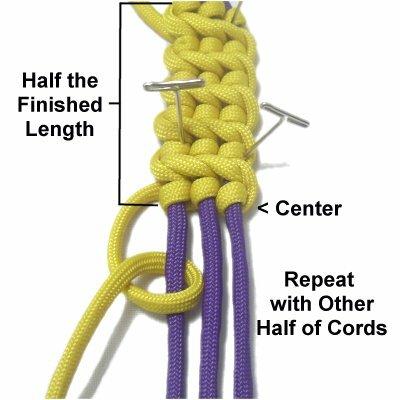 Be sure to add more length to all the cords if you need to make a clasp. For projects where you mount the cords to something like a ring or buckle, you will need to double the length if you FOLD the cords. Preparation: Secure all the cords vertically on your board, with the working cord to the left of the three holding cords. Mentally number the holding cords. The holding cords should be stretched, so they have tension. This helps to eliminate the twisting that sometimes occurs as you construct the Guitar Bar. Place a piece of masking tape across the cords at the center to mark it, and to help you form a straight row. 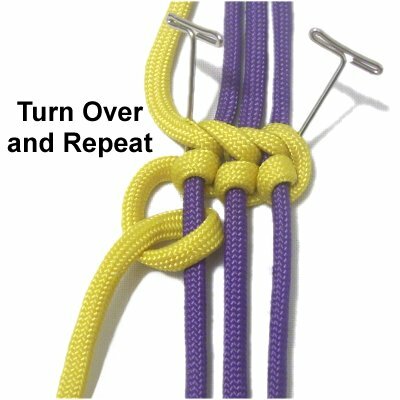 Step 1: Tie a counter-clockwise Half Hitch with the working cord, onto holding cord 1. 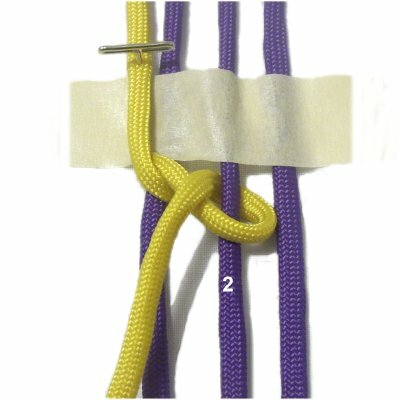 A Half Hitch is tied by passing over - under the holding cord. As you pull it left, pass over the working cord. Step 2: Tighten the knot carefully, so that it rests against the tape. Move the working cord to the right before tying the next knot. Step 3: Use the working cord to tie the next Half Hitch onto holding cord 2. Tighten carefully, and pull the cord to the right prior to tying the next knot. Step 4: Tie the final Half Hitch for this row onto holding cord 3. Step 5: Turn over the Guitar Bar (upside down), so the working cord is once again on the left. 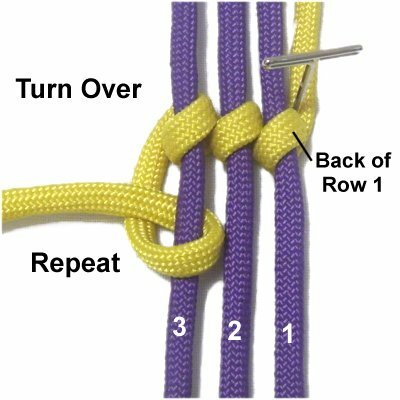 Repeat steps 1 - 4, tying the Half Hitches onto cords 3 - 1 (in that order). Step 6: After the second row is completed, turn over the design again. Step 7: Repeat steps 5 and 6 several times, until the Guitar Bar is 1/2 the length you plan to make. Push the knots close together as you progress. Step 7, continued: Turn the design around (or the entire board), and go back to the center. Make sure the BACK is face up for the next row (step 5). Repeat steps 5 - 7 with the other half of the cords, until the Guitar Bar is the size you want. Step 8: The best way to finish the bar is to tie a TIGHT Square Knot at each end. 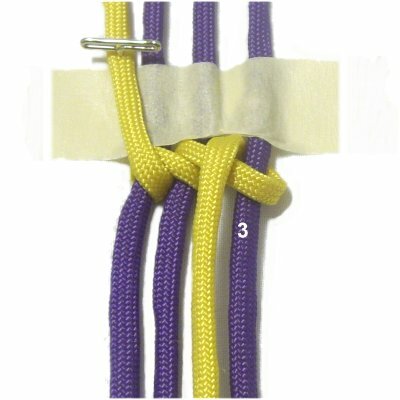 You can then use the ends to make a clasp, or tie additional knots. Finish off any cords you don't need. Have any comments about the Guitar Bar? Contact Me.